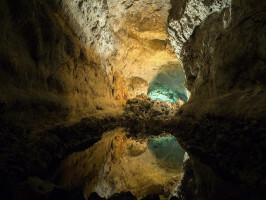 See the best of Lanzarote with this all-in-one sightseeing tour that ends up in the artist César Manrique’s house. 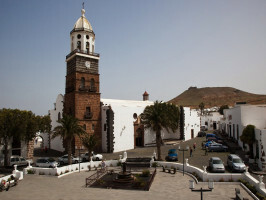 Leave the resorts behind and join us on a journey to Teguise, the traditional, old city of the island, with its cobbled streets you will feel like you’ve been transported back in time. Here we’ll visit the iconic church, to admire the architecture and history surrounding it. Afterwards, we’ll head towards Haría and enjoy breathtaking views of El Valle de las Mil Palmeras or also known as “the valley of the thousand palm trees.” Continuing from here, we’ll make our way to Volcan de la Corona and Malpais de la Corona, to visit the “Cueva de los Verdes” one of the most precious natural caves around formed by volcanic eruptions and you’ll quickly realize why this location is loved by tourists around the world. Crossing Mala town, we’ll have a brief stop at the Aloe Museum where we’ll be privileged to see the prickly pear plantations to produce cochineal which is more commonly used as natural dye. 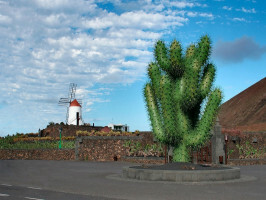 We will also stop by Guatiza Town to make the most of a short visit to the Cactus garden. 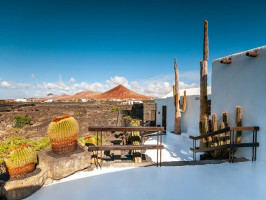 Saving the best till last, our final visit will be to the César Manrique Foundation situated in the house of the famous Lanzarote born artist. This unique house is created by a series of volcanic bubbles. Contemplate his work as he mixes nature with art. 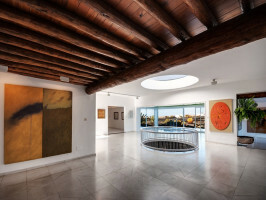 Also admire various paintings and sculptures from other Avant-Garde artists. After an action-packed day, including a little bit of everything, sit back and enjoy the journey back to your starting point. If you have chosen the option with lunch included you will eat at Haria, restaurant El Cortijo (buffet) in which you will have at your disposal different salads, pasta, grilled chicken, paella, vegetables, meatballs or croquettes and potatoes. If you have not chosen the lunch option, you will have free time in the area. 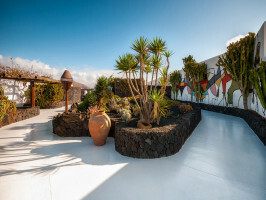 Special meeting points from Costa Teguise at 09:30, Arrecife at 09:10, Puerto del Carmen at 08:30, Puerto Calero at 08:55 and Playa Blanca Resorts at 08:05. This tour is organized according to your needs and ideas. You must call at least 24 hours before in order to arrange a meeting/pick-up point and time. guide/instructors speak: English, Dutch, German and Spanish.